The Palanga Amber Museum was opened in 1963 in the mansion of Count Felix Tyszkiewicz built in 1897 according to the project of the German architect Franz Heinrich Schwechten. It is one of the most popular museums in Lithuania which was founded more than 50 years ago. In 2013-2015 it was refurbished with the support from the European Union and the Lithuanian state funds and adapted to modern cultural tourism, including new expositions of aristocracy halls on the 1st and amber on the 2nd floor; the Centre of the Baltic State cultural communication and art events; a visitor service terminal and a conference room. The museum holds exhibitions, concerts, cultural meetings, conferences and seminars. After World War II, the mansion was turned into a creation and rest home for artists. The first Amber museum exhibition displaying 478 exhibits was opened on 3 August 1963 and occupied 96 sq. m. in two ground floor rooms. The exhibition was updated and enlarged in 1965, 1969, 1986 and 2011. At the Palanga Amber Museum, which opened after the renovation on April 24, 2015, you can see about 6 thousand exhibits, which present the history of amber in the context of the Earth evolution and the world cultural history. 70 unique amber pieces presented to the museum visitors are valued not only for their impressive size (the largest – „Sun Stone“ – weighs 3524 grams), but also for the form, prints, colour and shades which makes them invaluable scientific objects, testifying the Eocene period, climatic conditions, flora and fauna. 55-40 million years ago the Amber forest grew in the prehistoric Scandinavian continent in warm and humid climate. Conifers of the Pine (Pineceae) family, which in the scientific literature are identified by the common name of Pinus succinifera, grew alongside subtropical flora species, and the forest fauna was extremely rich in insects. In the warming climate amber trees failed to adjust to the new weather conditions and became very resinous. They excluded abundant quantities of resin and gradually disappeared; their resin residues accumulated in soil were exposed to physical and chemical environmental factors and finally turned into amber. The museum collection of amber inclusions (about 15 thousand objects) is one of the largest and the most scientifically valuable in the world. The most interesting specimens, including one of the world’s rarest exhibits – lizard, are presented in the showcases equipped with magnifying lenses. The resin of the conifer trees growing 50 million years ago was a real trap for insects, arachnids and even lizards. Vegetation samples of flowers, pollen, and leaves can also be found in the resin. Although the viscera of the organisms preserved in amber is mostly decomposed, their surface structures have survived to the smallest detail. This allows scientists to precisely describe and identify the then existing living organisms and trace their evolution course. The archaeological hall exhibits copies of Juodkrantė treasure artefacts of the Stone Age found in 1862-1899 in the Curronian lagoon while the German Stantien und Becker company excavating amber. These artefacts are not only beautiful works of applied art, but also worldview reflections of the Neolithic people. The so-called Palanga treasure collected by Count Felix Tyszkiewicz also includes interesting Stone Age amber jewellery items, which were found in the twentieth century while digging amber in the pre-costal marshes. The abundant archaeological findings allow following the exchange trade routes since the Neolithic era. A 17th century amber-encrusted monstrance from Seda church and a 16th-17th century amber altar, which belonged to the old Tytuvėnai church, occupy an honourable place in the exposition of the Amber Museum. Old written sources provide data about Palanga amber masters. The exhibition includes an amber processing machine of the end of the 19th century, which belonged to Vladas Žilius, and a variety of pre-war amber produce from Palanga. A spacious hall is dedicated to works of amber craftsmen and professional artists. The exposition presents a wide range of amber jewellery including articles of the 1970s-1980s made by well-known authors like Horst Taleikis, Regina Andriekutė, Jonas Liukaitis, Elena Augaitytė, Dionyzas Varkalis, Ona Katkienė, Joana Martinkienė, Alfredas Jonušas, Irena and Feliksas Pakutinskai, ect., who proclaimed Lithuania in the exhibition halls of the world. The professional artists’ works reflect the evolution of artistic amber processing: from cutting into uniform components to original combinations with silver (Feliksas Daukantas, Kazimieras Simanonis, Petras Balčius), seaweeds or even horsehair (Birute Stulgaitė). At the end of the exposition, there is a JSC „Amber World“ shop, where you can buy certified Baltic amber inclusions, and get acquainted with modern jewellery trends. The space of the mansion’s first floor strikes visitors by the newly reconstructed historical interiors. In order to restore the mansion authentically, it was necessary to look for reliable sources. 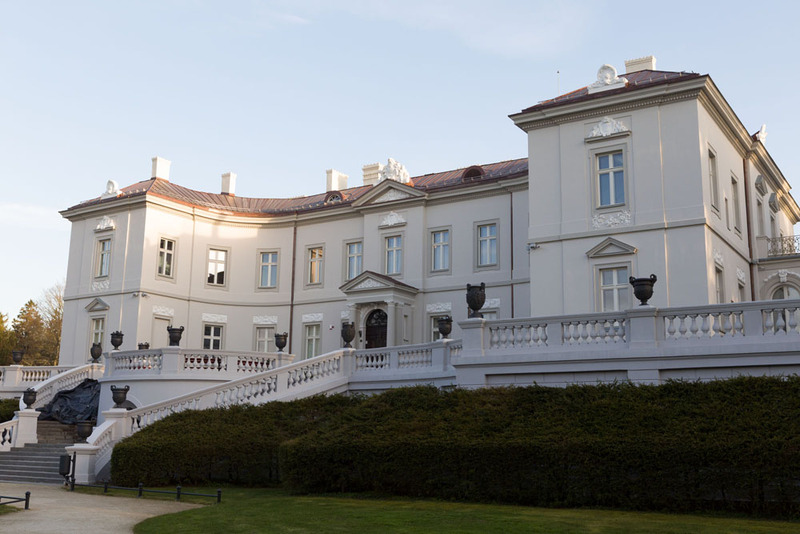 The archive of projects of technical drawings and paintings of the Palanga mansion were found in the State Secret Archives of the Prussian Cultural Heritage (Geheimes Staatsarchiv Preußischer Kulturbesitz) in Berlin. Seven halls are open to visitors: the Event Hall, the Red Parlour, the Grand Parlour, the Countess’s Cabinet, the Blue Parlour, the Young Count’s room and the Small Parlour. In these representative halls of the mansion, the aristocratic residence environment was restored and the furniture and art works of the end of the 18th and the 19th centuries deposited by the Lithuanian Art Museum and private persons are displayed.